The New York City Mansion Tax is a progressive buyer closing cost which ranges from 1% to 3.9% of the purchase price on sales valued at $1 million or more. The Mansion Tax itself consists of 8 individual tax brackets, with the lowest rate of 1% applying to purchases at or above $1 million and less than $2 million. The highest Mansion Tax rate of 3.9% applies to purchases of residential property valued at $25 million or more. Estimate your Mansion Tax in NYC with Hauseit’s Interactive Mansion Tax Calculator for Buyers. The Mansion Tax in NYC was originally imposed in 1989 as a fixed 1% Transfer Tax on purchases of $1 million or more. Although the tax was never adjusted for inflation since then, the Mansion Tax itself was overhauled in April 2020 as part of the 2020 New York State Budget. While the Mansion Tax is technically an additional NYS Transfer Tax, it’s usually discussed separately from NYC & NYS Transfer Taxes. This is because buyers customarily paid the Mansion Tax, while sellers typically pay the standard NYC & NYS Transfer Taxes. 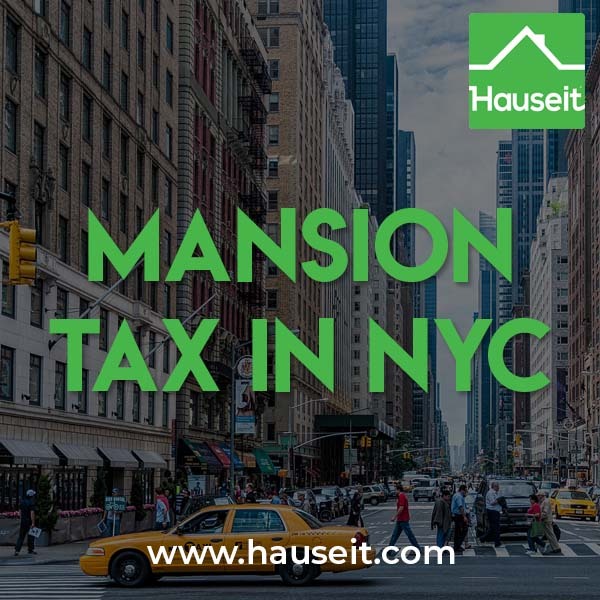 We explain everything you need to know about the NYC Mansion Tax in this article, including how you can offset some or all of your Mansion Tax bill as a buyer by requesting a Hauseit® Buyer Closing Credit. How Much Is the New York City Mansion Tax? Who Pays the NYC Mansion Tax? How Can I Avoid Paying the Mansion Tax in New York City? Does the New York State Mansion Tax Apply to Furniture and Personal Possessions? Does the Mansion Tax Apply to the Purchase of New Construction? What Other Closing Costs Are Paid by the Buyer in NYC? Is the NYC Mansion Tax Deductible? What Is the Future of the NYC Mansion Tax? What Is New York Tax Law Article 1402-A? Who Pays the Mansion Tax in New York? The NYC Mansion Tax is a buyer closing cost of 1% to 3.9% which applies to purchases of residential property on or above $1 million. The Mansion Tax itself applies to all residential real property or interest in residential real property which includes condos, co-ops as well as one to three family houses. Pro Tip: Be careful as not everyone has the same idea of what constitutes residential property vs commercial property. For example, lenders may view one to four family properties as residential. If there is a dispute on the classification of a property, you can look at the Certificate of Occupancy for guidance. Note that the law around the Certificate of Occupancy has only been around since 1938, and as a result there are properties that predate this law. As a result, some properties may not have a Certificate of Occupancy as long as they didn’t have a trigger event such as a major renovation. Under section 1402-a of the Tax Law, the Mansion Tax must be paid within 15 days of closing along with the standard New York State Transfer Tax and New York City RPTT Transfer Tax which are customarily paid by the seller. The New York Mansion Tax was originally imposed in 1989 by then Governor Mario Cuomo. The tax has not been adjusted for real estate inflation since it was written into law, although it was compressively overhauled and turned into a ‘progressive’ tax in April 2019 as part of the 2020 New York State Budget. The increase in the Mansion Tax was largely driven by the need to increase funding to the NYC Subway system, operated by the MTA. Fortunately, can you can easily offset some or all of the Mansion Tax as a buyer in NYC by requesting a Hauseit® Buyer Closing Credit. We discuss this in greater depth further down in our post. The New York City Mansion Tax starts at 1% for purchases on/above $1 million and below $2 million. The tax is as high as 3.9% for sale prices of $25 million or more. Note: The NYC Mansion Tax is only applicable to residential condos, co-ops and one- to three-family properties. Since this example is for a 4-family brownstone (townhouse), the Mansion Tax does not apply! The New York Mansion Tax is typically paid by the purchaser in a transaction. However, keep in mind that just about everything is negotiable in a New York City real estate deal. It’s not uncommon for buyers to ask the seller to cover the Mansion Tax, however the reality is that sellers rarely agree to do this. One of the main reasons why is because the Mansion Tax paid on behalf of a purchaser is not tax deductible and therefore won’t allow the seller to reduce his or her capital gains taxes payable on the sale. The co-op apartment you are looking to buy has been on the market for 6 or more months and the seller is highly motivated. It’s difficult to obtain financing for the building, so the seller has fewer buyers to choose from. The apartment requires a tricky, gut-renovation or has some other unique feature which makes it much harder to sell. There is strong buyer competition and possibly a bidding war. The asking price is well above the $1 million threshold. Pro Tip: Estimate your buyer closing costs in NYC with Hauseit’s interactive closing cost calculator. The Mansion Tax in NYC ranges from 1% to 3.9% based on your purchase price. There are 8 individual tax brackets. The easiest way to avoid the mansion tax when buying a property in NYC is to request a buyer broker commission rebate from your buyer’s agent. The typical buyer agent commission rebate on a purchase in NYC can save you $20,000 or more on your purchase, which can fully offset the mansion tax bill which is payable on your purchase. Requesting a buyer agent commission rebate in NYC is an automatic way to save money on your purchase. Real estate commission rebates work in New York City because sellers usually pay the same total commission regardless of whether or not a NYC buyer’s agent is involved in the deal. As a result, the cost of a buyer’s agent is already built into the sales price even if you don’t elect to have a buyer’s broker represent you on the purchase. By representing you on the purchase, a buyer’s agent is able to collect half of the total 6% average NYC real estate commission which would otherwise go to the listing agent. Your buyer’s agent is then able to share a portion of this commission with you at closing in the form of a NYC buyer broker commission rebate. Aside from helping you cover the mansion tax through a commission rebate, a seasoned buyer’s agent will also add value to your deal by helping you negotiate effectively, preparing and submitting a NYC board application, and ensuring your deal has a smooth journey to closing. A buyer’s agent can also help you learn about building policies (such as the sublet policy) and advise you as to whether or not it makes sense to waive your mortgage contingency when buying a property in NYC in order to more effectively compete against other bidders. Pro Tip: Be very careful when buying a sponsor unit at a price of approximately $970,000 or more. If you are paying transfer taxes, the sponsor’s attorney fees and for your share of the superintendent’s unit, you will likely be right on the edge if not over! Whether the superintendent’s unit is included in your “consideration” depends on how the sponsor sells the unit. It could be an additional $5,000 to $10,000 that you did not expect. A working capital fund contribution will usually not count towards your consideration as the money goes to the condo and not the sponsor. Remember consideration is what you give up of value, not simply the contract price! No. The Mansion Tax is not applicable to the portion of the purchase price associated with any personal property such as furniture, fixtures and art. However, if your purchase includes furniture or other property then you would be required to pay sales tax on this and itemize it on your New York State income tax return. Pro Tip: What if your property purchase includes legitimate and substantial personal property along with the real estate? In this case, it may be beneficial to split up the purchase with two separate contracts, especially if you are on the cusp of hitting the Mansion Tax. For example, if the real estate comes with a very valuable piece of artwork, it may be legitimate to split that up as a separate transaction. Remember though that personal property is typically included with the real estate in a deal, and that’s why there is no sales tax except for perhaps $30 or $40 for the cost of the title search. Yes. If a buyer agrees to pay any of the real estate closing costs traditionally covered by the seller (grantor), then those additional expenses will be added to the purchase price for the purposes of calculating the mansion tax payable on the purchase. This is a particularly important consideration if you are buying new construction. Because the city and state transfer taxes for new construction are typically paid by the buyer, this means that your purchase price will include these closing costs for the purposes of calculating your mansion tax. If you agree to pay the seller’s (sponsor’s) legal fees, you may also need to add those to the purchase price when computing the mansion tax. As the example above demonstrates, the mansion tax still applies to this purchase even though the ‘sale’ price is below $1 million. This same logic may also apply if you happen to be buying a foreclosure or a short sale. If you agree to pay the seller’s broker fee in order to reduce the purchase price, the listing agent commission must be added onto the purchase for the purposes of computing the mansion tax. The mansion tax is one of the largest New York City closing costs for buyers, however there are other closing costs you should be aware of which we explain in this article. As you can see, closing costs in NYC are the highest if you happen to be financing the purchase of a new construction unit. Confused about closing costs for co-ops vs. condos? Closing costs vary between condos and co-ops in NYC due to three specific closing costs. If you pay the mansion tax on your purchase, the expense will increase your tax basis and ultimately reduce the capital gains taxes payable when you decide to sell the property. In addition, the mansion tax does not generally apply when real estate is transferred via inheritance, gift or bequest. Unlike property taxes however, the mansion tax paid at the time of purchase is not considered to be tax deductible on your Federal tax return. Pro Tip: Calculate how much apartment you can afford in NYC with Hauseit’s interactive home affordability calculator. The Mansion Tax was comprehensively overhauled and converted into a progressive tax in April 2019. Prior to that, it was not adjusted since its enactment in 1989. Because tax legislation is infrequent, it’s highly likely that the current Mansion Tax rates enacted in April 2019 will remain in place for decades. The April 2019 Mansion Tax overhaul was enacted in lieu of an annual Pied-à-Terre tax which was also being considered by lawmakers. The Mansion Tax legislation was generally viewed as the more favorable outcome by the real estate community, as it is a one-off tax instead of an annual levy. 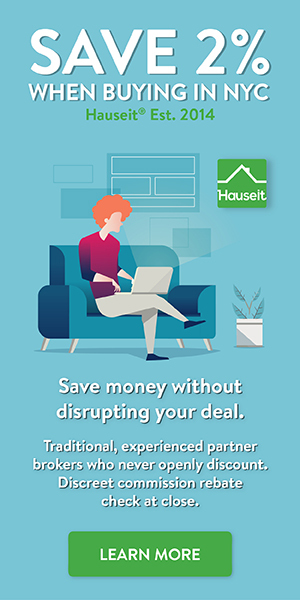 Pro Tip: Estimate your seller closing costs in NYC with Hauseit’s interactive closing cost calculator for sellers. (a) In addition to the tax imposed by section fourteen hundred two of this article, a tax is hereby imposed on each conveyance of residential real property or interest therein when the consideration for the entire conveyance is one million dollars or more. For purposes of this section, residential real property shall include any premises that is or may be used in whole or in part as a personal residence, and shall include a one, two, or three-family house, an individual condominium unit, or a cooperative apartment unit. The rate of such tax shall be one percent of the consideration or part thereof attributable to the residential real property. Such tax shall be paid at the same time and in the same manner as the tax imposed by section fourteen hundred two of this article. (b) Notwithstanding the provisions of subdivision (a) of section fourteen hundred four of this article, the additional tax imposed by this section shall be paid by the grantee. If the grantee is exempt from such tax, the grantor shall have the duty to pay the tax. (c) Except as otherwise provided in this section, all the provisions of this article relating to or applicable to the administration, collection, determination and distribution of the tax imposed by section fourteen hundred two of this article shall apply to the tax imposed under the authority of this section with such modifications as may be necessary to adapt such language to the tax so authorized. Such provisions shall apply with the same force and effect as if those provisions had been set forth in this section except to the extent that any provision is either inconsistent with a provision of this section or not relevant to the tax authorized by this section. Technically speaking, the modification to New York Tax Law kept the original 1% Mansion tax in place while adding an additional surcharge tax for sale prices of $2 million or more as part of a new section of the New York Tax Law – §1402-b (reproduced below). The combined 1% base rate and surcharge rates are reflected in the combined NYC Mansion Tax Rates referenced in this article. New York Tax Law Article § 1402-b: Supplemental tax in cities having a population of one million or more. (a) In addition to the taxes imposed by sections four-teen hundred two and fourteen hundred two-a of this article, a tax is hereby imposed on each conveyance of residential real property or interest therein within any city in this state having a population of one million or more when the consideration for the conveyance is two million dollars or more. For purposes of this section, residential real property shall include any premises that is or may be used in whole or in part as a personal residence, and shall include a one, two, or three-family house, an individual condominium unit, or a cooperative apartment unit. Such tax shall be paid at the same time and in the same manner as the taxes imposed by sections fourteen hundred two and fourteen hundred two-a of this article. (7) two and nine-tenths percent of the consideration or part thereof attributable to the residential real property when such consideration for the entire conveyance is at least twenty-five million dollars. (b) Notwithstanding the provisions of subdivision (a) of section fourteen hundred four of this article, the tax imposed by this section shall be paid by the grantee. If the grantee has failed to pay the tax imposed by this article at the time required by section fourteen hundred ten of this article or if the grantee is exempt from such tax, the grantor shall have the duty to pay the tax. Where the grantor has the duty to pay the tax because the grantee has failed to pay, such tax shall be the joint and several liability of the grantor and the grantee. (c) Except as otherwise provided in this section, all the provisions of this article relating to or applicable to the administration, collection, determination and distribution of the tax imposed by section fourteen hundred two of this article shall apply to the tax imposed under the authority of this section with such modifications as may be necessary to adapt such language to the tax so authorized. Such provisions shall apply with the same force and effect as if those provisions had been set forth in this section except to the extent that any provision is either inconsistent with a provision of this section or not relevant to the tax authorized by this section. The Mansion Tax in New York is customarily paid by the buyer. The mansion tax applies to purchases of real property valued at or above $1 million, and it is one of the largest closing costs for buyers in New York. You can offset the New York Mansion Tax bill by requesting a Hauseit® Buyer Closing Credit. Pro Tip: Thinking of buying a rental property? Estimate your rental property returns using Hauseit’s interactive rental property calculator. What Is a Letter of No Objection in NYC Real Estate? if a INC company punchers two 3 family new house in NYC with one contract, the sale price is $2.55M how much of transfer tax? thanks!